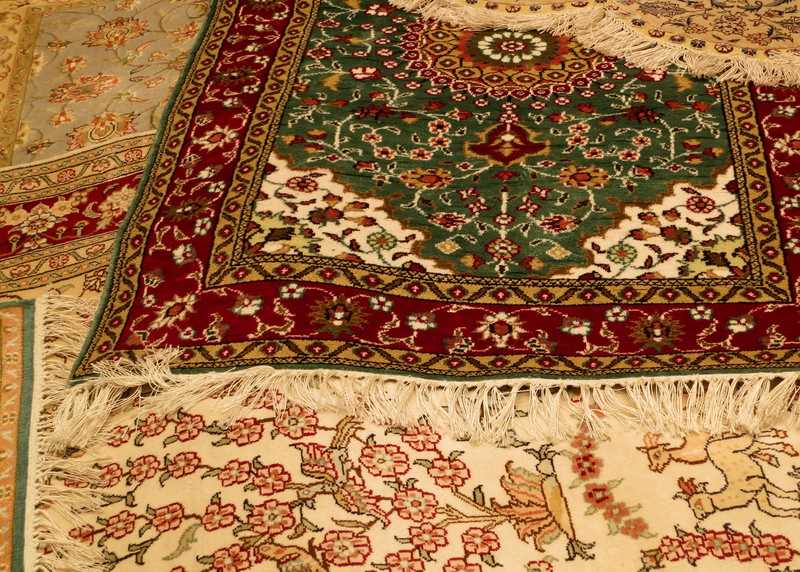 Dozens of Turkish rugs were scattered on the floor in Kusadasi, Turkey, thrown out in a frenzy of encouraging us to buy. The rugs were flying, quite literally, and landing on the floor in front of us. Twenty minutes earlier they had been neatly rolled up at the back of the room. Now five Turkish Rug salesmen were expertly flipping them out onto the floor, a new one every ten seconds. We had been wined; we had been dined; we had been educated. Now the final push was on, the push to get us alone in a room where more multi-thousand dollar rugs would be thrown at us and we would eagerly pull out our credit card with the highest limit. 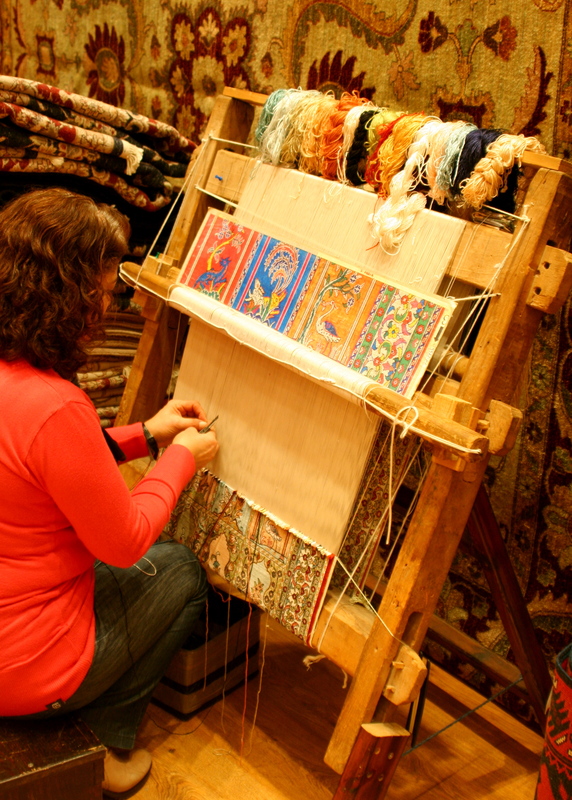 Part of the show was an interesting demonstration in the craft of carpet weaving. 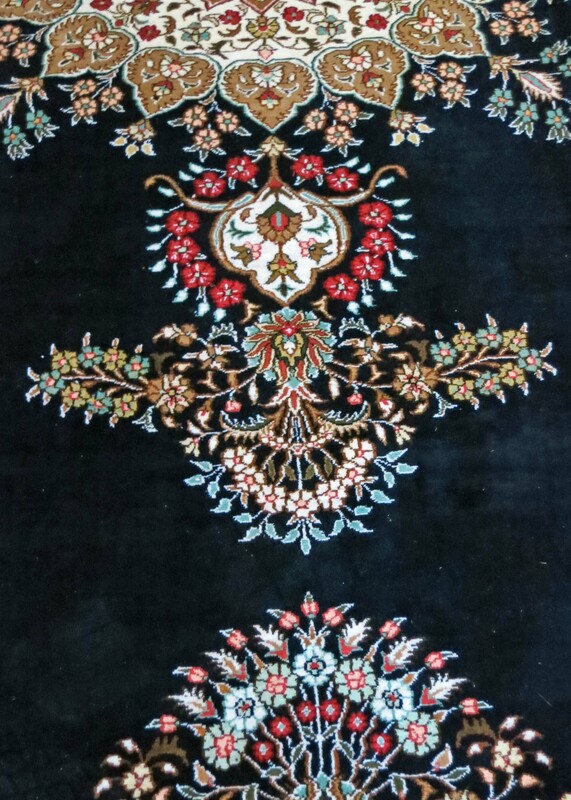 Fine rugs can take over a year to complete. Peggy was ready. The falling rugs had hypnotized her. Her eyes were glazing over and she was levitating out of her seat as a handsome dark-eyed Turk wooed her with fine words. The last time I had seen that look we had ended up with a timeshare in Mexico. This time I was fortified, however. When the salesmen was passing out drinks to soften us up, I was one of two from our tour group of 30 who ordered arak or raki, the unsweetened Middle-Eastern anis drink with the smell of turpentine and the kick of a mule. I admit the rugs were beautiful works of art, but I was arak strong. Our cabin in the woods of Southern Oregon did not need a Turkish carpet. “I’m sorry,” Peggy explained to her new best friend. “My husband doesn’t want a rug.” I was truly the bad guy in this scenario and the salesman gave me the look to prove it before he sidled off to corner another victim… oops I mean client. Buying a rug in Kusadasi is reputedly the quintessential Turkish experience and a whole industry is set up to make sure you have it. The cruise industry is a major partner in this endeavor. Lectures on bargaining and quality are given on board the ship before arrival. Lists are provided of safe, preferred shops (i.e. those that share their profit with the ship). Our tour guide hurried us through ancient Ephesus sergeant-like to make sure we would make it to the shop on time. Tours are tightly scheduled. Each tourist needs the opportunity to buy a carpet. Everyone profits. For the cruise ship this can mean a 50-60 percent kickback. I hurried Peggy out with the promise of lunch and the opportunity to buy presents for the grandkids. Her brother John and his wife Frances stayed to buy a carpet, however, and ended up with two. Later we celebrated with them in their rambling Texas home as they rolled their children’s inheritance out on the floor. Dozens of small shops were located in a modern Turkish bazaar near the port. It was touristy but fun. Since we were one of the last ships of the season, Peggy found numerous bargains to make up for carpet we didn’t buy. 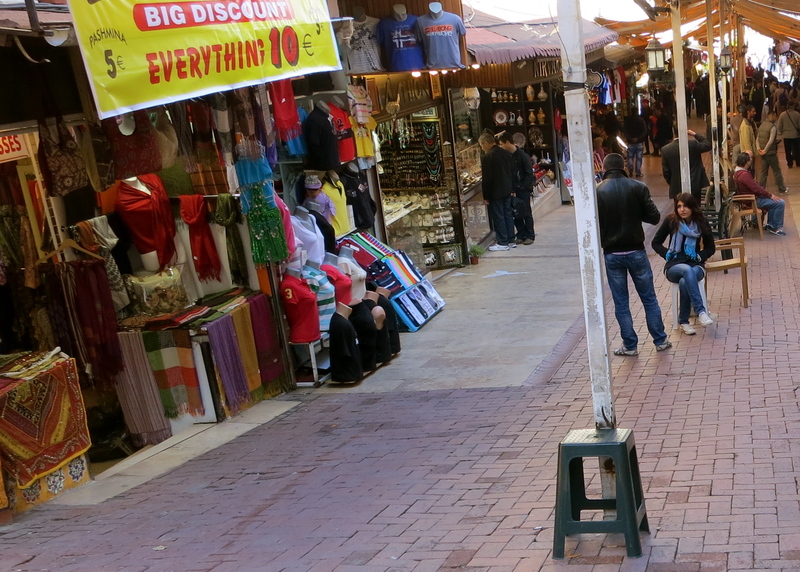 As we wandered through the shops of Kusadasi I was attracted by the wealth of colors. 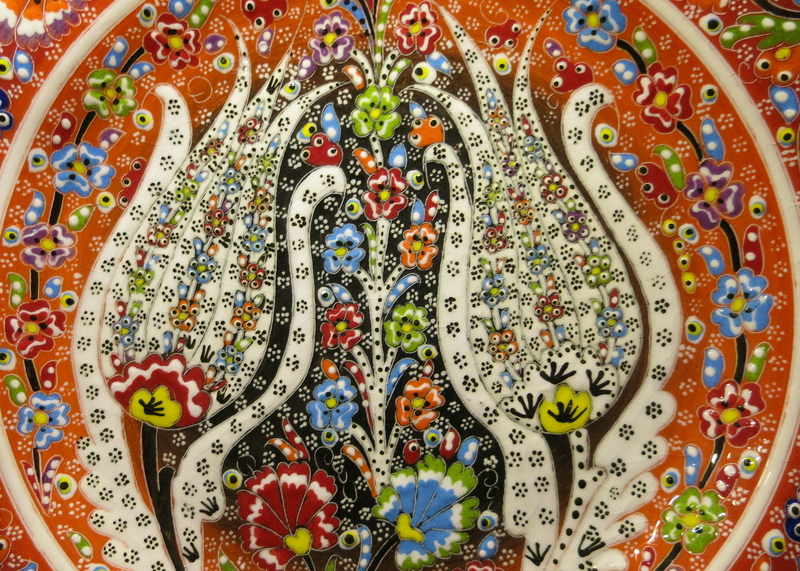 This plate closeup is another example of the rich colors and intricate patterns found in the shops of Kusadasi. 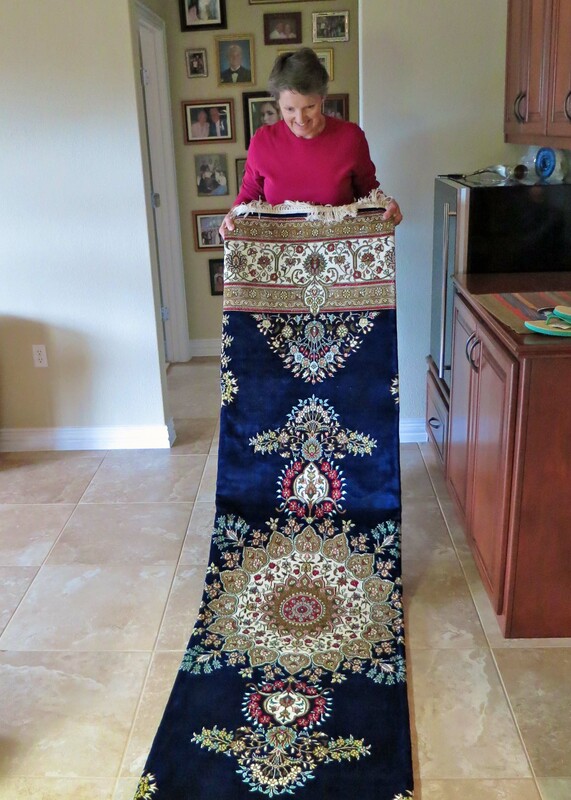 Frances eagerly unrolls John and her new silk carpet in their Texas home. A closer look at the family heirloom. It really is beautiful and John assures me they bargained for a good price. NEXT BLOG: We visit the Greek Island of Mykonos on our Mediterranean cruise adventure and meet the island’s famous Pelicans up close and personal. Wow.. those rugs really are quite beautiful.. I can picture you now giving Peggy the look that says”Uh, no my dear”.. 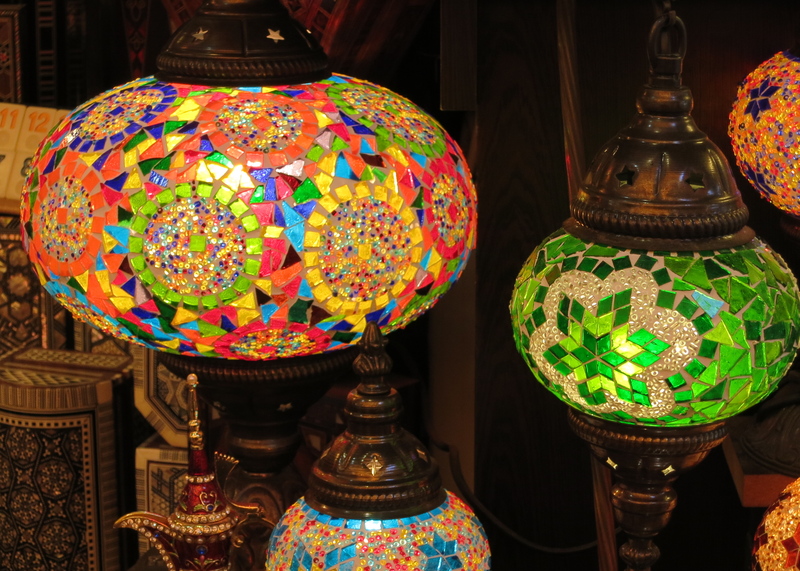 I would however would have begged you for one of those colorful lamps.. gorgeous.. Suspect she would have got the lamps… Grin. She was on a mission, however, buying toys for the grandkids and scarves for her women friends. 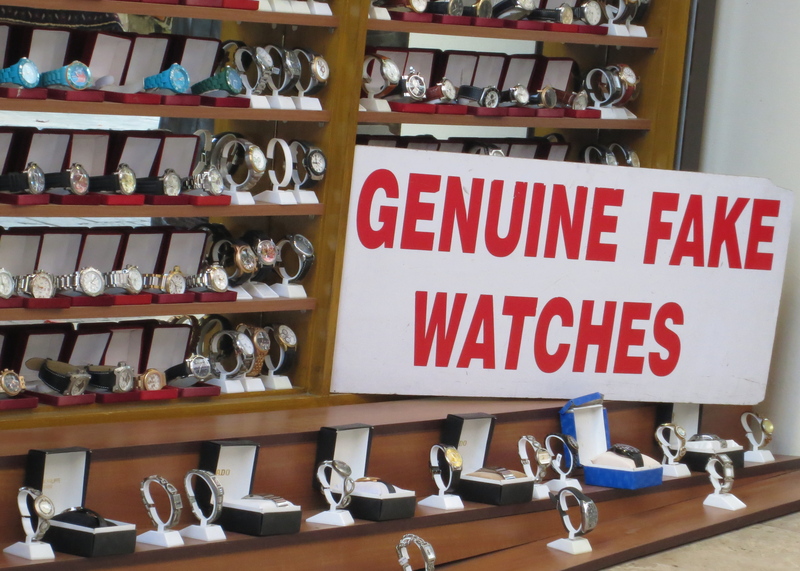 …yes, and I could not have gone another step without a genuine fake watch! I liked the fact that the shops and sales people had a sense of humor, Alice. We also found things fairly low key once we got away from the rug salesman. Thanks for visiting the blog!